The Fighting Spirit returned for one game, at least, as the Yankees survived yet another early-inning deficit and rallied to beat the Rays 4-3 on Thursday night. Domingo German put the Yankees quickly in a hole when Matt Duffy took him deep on the first pitch he saw. It was first time a Yankee pitcher surrendered a homer on the very first pitch of the game (i.e. top of the first inning) since Masahiro Tanaka served one up to Jose Reyes on June 17, 2014. After that early hiccup, German settled down and pitched six strong innings, allowing just two more runs while striking out a career-high 10 batters. When German is locked in, he might have the nastiest stuff on the team with a biting curveball and filthy changeup that can make hitters look like little-leaguers at the plate. ¡De Santo Domingo para el mundo! ??? He got 26 swings-and-misses, tied for the fourth-most by any pitcher in a game this year, and seven more than any other Yankee pitcher this season. Half (13) of those misses were with his curveball; the only other pitcher this season with more curveball whiffs in a game was Carlos Carrasco (14) on May 9. The curveball is more than just a whiff machine, though, he also netted four called strikes with the pitch. That nasty combo of swinging strikes (41% whiff/swings) and looking strikes (36% called strikes/takes) puts German among the elite curveball artists this season. Among pitchers that have thrown at least 100 curves, German and Charlie Morton are the only guys with a Whiffs per Swing rate of at least 40 percent and a Called Strikes per Take rate of at least 35 percent. Gleyber Torres made sure that German would get his first MLB win, crushing a 96-mph fastball from Blake Snell into the left field seats in the fifth inning, and turning a 2-1 deficit into a 4-2 advantage. It was his 13th career homer, and eighth that either tied the game or gave the Yankees a lead. Through Thursday, those eight go-ahead/tying homers were three more than any other Yankee had hit since his debut on April 22. Incredibly, what he is doing — relative to his age, experience and position — is nearly unprecedented. The only other rookie second baseman age 21 or younger to hit at least 13 homers in a season was Hall-of-Famer Joe Morgan with 14 in 1965. 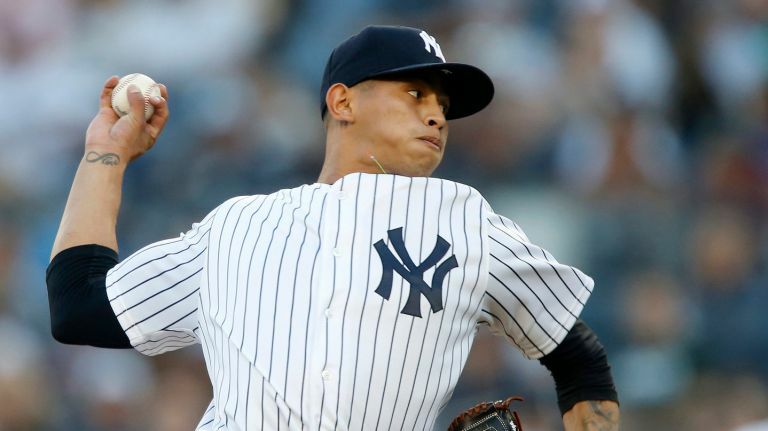 The Yankees overflowing pipeline of young talent was in the spotlight again on Friday night as Jonathan Loaisiga delivered a super-impressive debut performance in the 5-0 win over the Rays. It was their third shutout in eight games; they had just two shutouts in the first 58 games of the season. Loaisiga struggled with his command (four walks) but dominated hitters with his electric three-pitch mix (18.7% swinging strike rate) as he tossed five scoreless innings while striking out six. He also showed incredible poise, a bulldog mentality and an uncanny calmness on the mound, holding the Rays to one hit in 10 at-bats with runners on base. FILTHY 89mph Changeup from Jonathan Loaisiga. He is the first pitcher in franchise history to allow zero earned runs and strike out at least six batters in his first career major-league game. And he is just the second Yankee pitcher ever to make his MLB debut at Yankee Stadium as a starter and not give up a run. The other was Sam Militello on Aug. 9, 1992 against the Red Sox. Gary Sanchez broke the game open with bases-loaded three-RBI double in the eighth inning. That had made him 12-for-23 (.522), including three sac flies, and 25 RBI with the bases loaded since the start of 2017. He has the highest bases-loaded batting average over the last two seasons among players with more than 20 plate appearances (through Friday). Another home series vs. the Rays, another series win; another Luis Severino start, another Severino gem; another power outburst, another Yankee victory. Just like clockwork, the Yankees cruised to a 4-1 win over the Rays on Saturday thanks to the familiar Bronx Bomber formula of power pitching plus power hitting. 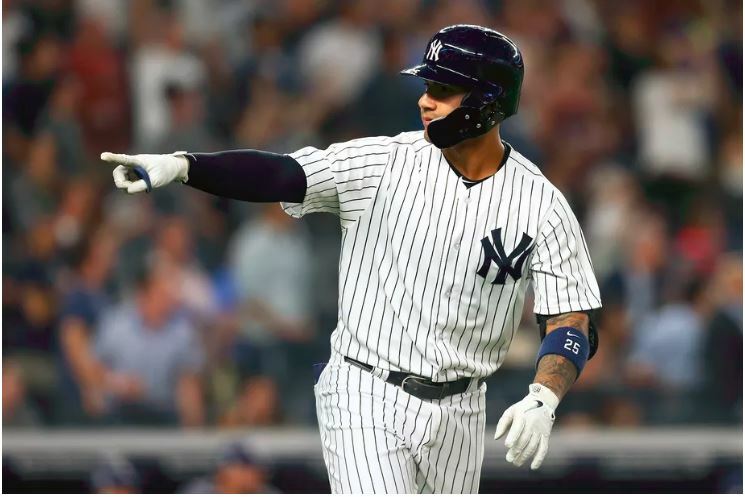 The victory clinched their 12th straight home series win against Tampa Bay, the Yankees longest such streak since winning 17 in a row in the Bronx against the Washington Senators from 1952-57. Luis Severino battled through a rocky first few innings, but still delivered a masterful eight-inning, nine-strikeout, scoreless performance. He dominated the Rays with an electric fastball that averaged a season-high 98.6 mph and topped out at 100.2 mph (per Statcast). Six of his nine punchouts came on pitches clocked 99 mph or faster, matching the most in any game by a pitcher since pitch velocity tracking began in 2008 (Stephen Strasburg also did it in his MLB debut on June 8, 2010). Severino now has 15 strikeouts on pitches 99-plus-mph this season; all other MLB starters have combined for 18 (through Saturday). Severino has been a beast in the Bronx this year, earning our #FunFact of the series: He has allowed no more than two runs in each of his first eight home starts in 2018, the longest such streak by any Yankee pitcher at Yankee Stadium (old or new) to begin a season. There would be no sweep of the Rays in the Bronx, as the Yankees punchless offense couldn’t rally from another early deficit, losing 3-1. Their deep hitting slump with runners in scoring position continued with an 0-for-7 performance on Sunday; in their last 12 games, dating back to the second game of the June 4 doubleheader versus the Tigers, the Yankees are 8-for-76 (.105) with RISP. Yet, they are 8-4 over this stretch thanks a pitching staff and defense that has given up just 24 runs in those 12 games. Sunday was the first game they lost this season at Yankee Stadium when allowing no more than four runs; they were an MLB-best 22-0 in those games. 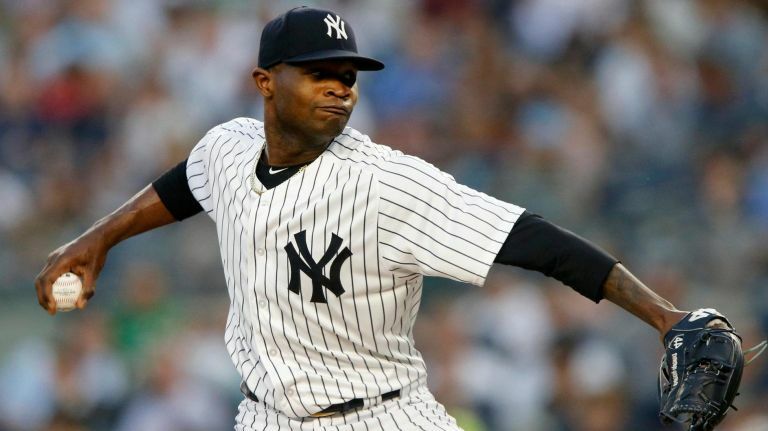 There was little to cheer about in the this game aside from the solid effort by CC Sabathia, who battled back after some early-inning struggles and lasted into the eighth inning while striking out a season-high 10 batters. It was just the second double-digit strikeout game for Sabathia in the last five seasons (the other was Aug. 17, 2017 vs. Blue Jays), as he became the oldest Yankee with at least 10 strikeouts in a games since a 40-year-old Andy Pettitte on April 24, 2013 against … the Rays.